The first edition of this booklet was published in the month of Ramadan of 1410 A.H./April 1990 AD by the Imamia Center, Inc., of Lanham, Maryland, U.S.A. 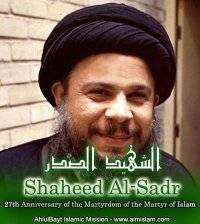 The author, who was born in al-Kadhimiyya, Baghdad, Iraq, on March 1, 1935 and was tortured to death by tyrant Saddam Hussein on April 9, 1980, has written a number of books the most famous of which are: Iqtisaduna (Our [Islamic] Economics) and Falsafatuna (Our [Islamic] Philosophy). The Translator has translated four titles written by al-Sadr: In addition to this one, he also translated A General Outlook at Rites, which was published in 1979, Contemporary Man and the Social Problem, which was published in 1980, both titles having been published by the World Organization for Islamic Services (WOFIS) of Tehran, Iran, and The General Bases of Banking in the Muslim Society which was published in Maryland, U.S.A., in 1981. I have been reluctant to respond to such requests due to my desire to focus my efforts on finishing the second volume of Iqtisaduna (“Our [Islamic] Economics”). The publication of this latter book has been the reason behind the increasing demand that I should issue a brief series explaining and simplifying the book’s researches so that they may become accessible and comprehensible by a larger number of readers. In order to avoid misunderstanding this question, we shall elaborately explain the difference between the economic doctrine and the science of economics. In fact, the difference between them is significant. The economic doctrine, as we have come to know, takes upon itself to discover a method for the regulating of the economic life according to the principle of equity. As for the science of economics, it does not provide a method for such regulating; rather, it derives its approach from the followed paths of societies, studying their outcomes and consequences, just as the naturalist studies the results and effects of, say, heat generating. We shall use many examples to explain the difference between the economic doctrine and the science of economics. The capitalist creed, for example, regulates the economic life upon the basis of the principle of economic freedom; therefore, it regulates the market upon the basis of the sellers’ freedom to determine the price of their goods. The science of economics does not attempt to bring forth another method for regulating the market; instead, its role is to study the market’s condition in the shade of the capitalist method, researching the fluctuation, fixing, rising or falling of prices in the free market as regulated by the capitalist method. After putting forth several examples explaining the differences between doctrine and science, we shall emphasize the fact that by the economic doctrine, whose existence in Islam we have been questioning and answering in the affirmative, we do not mean here the science of economics. As a religion, Islam does not have to discuss the sciences of economics, astronomy, mathematics, etc. We mean by it, rather, the economic doctrine itself. Our research and inquiry are about whether Islam provides a method for regulating the economic life, not whether Islam undertakes upon itself to conduct a scientific study of the available means and methods of economics contemporary to its advent and of their results. Such is the task of scientists of economics, the economists. The series arrives, after that, at an explanation of the viewpoint regarding the answer, deriving the accurate concept from the Islamic legislative system (Shari’a) which absorbs and incorporates different fields of knowledge. We prove this even by the very nature of Shari’a and its sources. After that, we shall dispel some doubts cast about the belief in the existence of the Islamic economics, and we shall answer these, too. In particular, I would like to refer to the allegation which says that Islam has brought ethical principles, and that it did not bring an economic system to regulate life; so, it is allegedly a mere preacher, not a system maker. We will explain how this charge capitalized on the ethical aspect of Islam and used it to overshadow the characteristics of its social organization despite the fact that Shari’a has indeed tackled both fields. It has, as a religion, applied the ethical aspect in order to ethically nurture the individual Islamically, and it has practiced the social organization as a system chosen by God for all the human family. Probably the most persistent question which occupies many minds, one which is repeated on every tongue and is recurrent with every problem through which the nation passes as long as it exists, is the question regarding the economic doctrine in Islam; so, is there any economics theory in Islam? Can we find a solution for this polar contradiction between capitalism and Marxism, which is dominating the world nowadays, through a new substitute derived from Islam and extracted from its method of legislation and organization? What is the extent of the potential of this new Islamic substitute in providing a good standard of living, in carrying out its message to the nation which is suffering nowadays from a severe doctrinal dilemma within the tumultuous torrent of such intense conflict with capitalism and Marxism? Contemplating on the Islamic substitute, or inquiring about it, in addition to the indication of the disappointment of the Muslim individual with the contesting wrestlers, reveal a new trend towards Islam, and all in all they reflect an Islamic consciousness which has begun crystallizing and taking various intellectual levels in the minds of many people, each according to the extent of his readiness and degree of response to Islam. The seeds of an Islamic consciousness manifest their existence in the minds of a large number of people on the level of raising questions about Islam, in the minds of others on the level of an emotional inclination towards it, and in yet other minds on the level of believing in it and in its rightly-guided leadership, in all spheres; it is their very belief in life itself. On the other hand, the Islamic faith itself forces Muslims to lay this question down to the faith or to its ‘ulema (theologians) who represent it, asking them to provide the better substitute for both contesting opponents, capitalism and Marxism. Islam declares very clearly in the Holy Qur’an, in the legislative texts of the Shari’a, and through all other vehicles of media at its disposal, that it opposes both capitalism and Marxism. Naturally, it is responsible for defining a positive situation, besides that negative one, to lead us to another path with whose viewpoint and general structure it agrees. The negative attitude, when separated from a constructive response which outlines its objectives and defines its pathway, means the retreat from life’s battlegrounds and the final social disintegration, not merely subscribing to a new ideology. By using the term “Islamic economic system,” we do not necessarily refer to any particular scientific research in economics. This sort of definition of the Islamic economic system enables us to face the challenge of differentiating between the “economic doctrine” and the “science of economics.” As long as the Islamic economic system is an economic doctrine, not a science of economics, we must know with more clarity the meaning of the economic doctrine as well as that of the science of economics: What are their differentiating characteristics? If this is not made clear enough by illustrations, the identity of the Islamic economic system will remain shrouded with ambiguity. When we, for example, describe someone as being an engineer, not a physician, we have to know the concept of “an engineer”. What is his function? What is his education? What sort of job does he do? What is the difference (in function) between him and, say, a physician? Only when we know the answers to all these questions can we for sure be able to ascertain the truth of the description of that individual and of his truly being an engineer, rather than a physician, etc. Also, when it is said that the Islamic economic system is an economic doctrine, not a science of economics, we must understand the general concept of the economic doctrine as a whole and the function of the economic creeds, the nature of their formation and the differences between the economic doctrine and the science of economics, so that we may be able to know, in the light of all of this, the identity of the Islamic economic system and the fact of its being an economics creed rather than a science of economics. In my judgment, the clarification of the identity of the Islamic economic system must be based on a complete differentiation between the economic doctrine and the science of economics, and on the realization of the fact that the Islamic economic system is a doctrine, a creed, not a science. Such a clarification will help us a great deal in putting forth the claim that there is an economic system in Islam, and it undermines the premises upon which those who deny the existence of an economic system in Islam stand, exposing their confusion in this regard. We can use this example to explain the difference between the economic doctrine and the science of economics. In the economic life, we are encountered by two distinct questions, like the ones the father encountered when asked about his son’s conduct; therefore, we may once ask: “How should the events go on in the economy’s life?” while we may ask: “How events are actually going on in the economy’s life?” The economic doctrine deals with the first question; it answers it, deriving the answer from the principles and ideals in which it believes and from its concepts of justice, just as the father derived his answer to the first question from his own principles and ideals. This link between price and demand is included in the calculation of both science and doctrine; but each treats it from its own particular angle. The science of economics studies it as a phenomenon which takes shape and is found in the free market, the market that is free of enforcement of pricing restrictions on goods by a higher authority such as the government. It explains how this phenomenon takes shape as a result of the market’s freedom, and it finds out the extent of the link between the price and the degree of demand. It explains whether the link between the price and the degree of demand is the same for all goods, or whether only some prices are affected when they are more in demand than others. The economic doctrine, on the other hand, when dealing with laborers’ wages, does not aim at the discovery of what actually takes place in the free market. Rather, it finds out a method to regulate it, one which agrees with its own concept of equity. It discusses the basis on which wages ought to be regulated, researching the possibility of whether or not the principle of economic freedom fits to be the basis to regulate wages according to its own concept of equity. Thereupon, we do not consider the function of the economic doctrine to be anything other than the definition of how the market ought to be regulated, according to its own concept of equity: Should it be regulated according to the principle of economic freedom, or on some other basis? The science of economics studies the already-regulated market, basing its study on the principle of economic freedom, for example, in order to be acquainted with what events take place at the regulated market according to the same principle, how prices of commodities therein are fixed, how the laborers’ wages are restricted, and how they increase or decrease. In other words, science discovers; doctrines evaluate and judge. The science of economics studies the general methods of production which help the growth of production such as the distribution of labor, specialization, etc., comparing, for example, two projects which produce, say, wrist watches; each project contains ten laborers. Every laborer in each project is required to produce one watch. In the other project, labor is distributed; each laborer is entrusted to carry out one single step of the operation required to make the watch. He repeats this sort of operation continuously, without participating in any other operation the watch has to go through during the manufacturing process. The scientific research in economics studies both of these projects, their relevant different methods, and the effects of each on production and on the laborer himself. The science of economics also studies everything related to the economic production of natural laws, such as the law of the reason behind crop underproduction in agriculture which says that the percentage of increase in agricultural output of the land is less than that of its expense. The science of economics studies all of this because it shows the discovery of facts on the economic level, as they take place, defining the factors which naturally affect production positively or negatively. If the increase in production is considered as means towards a higher end, what are the limits and frameworks enforced by the nature of that "higher end" on such means? Should the production policy be the basis for the regulation of distribution, or is it the other way around? In other words, which one of them ought to be regulated for the sake of the other? Shall we regulate the distribution of wealth in the manner which would make production plentiful and help its growth, so that the production’s interest would be the basis for distribution? If the national interest requires the legislation of interest on commercial bonds in order to attract capital to the fields of production, should certain measures be undertaken in this regard and the distribution regulated according to the recognition of the capital’s rightful share of the interest, or should we regulate the distribution of wealth according to the requirements of an equitable distribution, limiting production by methods and means which would agree with the requirements of an equitable distribution? The difference which we have scrutinized between the science of economics and the economic doctrine, that is, between researching what already is and what ought to be, is similar to that between the science of history and the ethical researches. In its general policy, the science of history agrees with the science of economics. In the process of evaluation and assessment, the policy of ethical researches is similar to the economic doctrine. People generally agree on making a distinction between the science of history and the ethical researches. They know that historians tell them, for example, the reasons which led to the downfall of the Roman Empire at the hands of the Germanic people, and the reasons which caused the crusades to erupt against Palestine and the failure of all of those crusades, the circumstances which contributed to the assassination of Julius Caesar while enjoying the zenith of his victory and glory, or those that led to the murder of and revolution against Othman ibn Affan, etc. History studies all of these events, discovering their causes and interrelations to each other, the results they brought forth and the developments in various fields. As a science, it confines itself to scientifically discovering such causes, interrelations and results; it does not evaluate events ethically. Within its scientific scope, history does not judge Caesar’s or Othman’s assassination to be ethically “right” or to be deviated from lofty moral ethics of conduct. Nor is it its job to evaluate the crusades or the invasion of Rome by the Germanics as being “just” or “unjust”. The evaluation of all of these events is linked to ethical researches. In the light of the ethical criteria of deeds can we judge, from the ethical viewpoint, that this deed is just or unjust, or that a certain norm of behavior is straight or crooked, deviated…, or whatever. What we have said, while discussing the function of the science of economics—indicating that it is confined to discovery alone, rather than to evaluation and assessment—is not restricted only to the science of economics. The basic function of all sciences is discovery. There is no difference between the economists and physicists, nuclear scientists, astronomers, psychologists, etc. except that the first perform their function in man’s economic field while the others perform this one: the discovering of facts, the latter’s interrelations and the laws governing their various fields of external physical nature, or of the human nature. Upon such a basis, we realize the error of the attempts that aim at subjectively differentiating between the science of economics and the economic doctrine by simply saying that the science of economics deals with production and its laws and the elements which help its growth, while the economic doctrine deals with distribution, its regulations and the interrelations which rise among the society’s individuals on its basis. Such attempts are wrong because we have already seen from the previous examples—which we provided in order to differentiate between the science and the doctrine—that the economic doctrine deals with both production and distribution (refer to the third example above), whereas the science of economics deals with both distribution and production (refer to the first and second examples above). The “iron law of wages,” as the second example explained, is a scientific law in spite of its relevance to distribution and the regulation of production. Based on economic freedom, or the basis of a central state supervision, it is considered as one of the issues of the doctrine in spite of its being a research in production. It is wrong, therefore, to judge a research that deals with production as being “scientific,” while labeling it as “doctrinal” if it deals with distribution. The distinguishing mark between the scientific research and the doctrinal one is the relationship such a research has with either the world of reality or with that of justice and equity: If the research deals with the economic life as it is in the world of reality, then it is “scientific,” but if it searches for justice and for means to effect such justice, then it is “doctrinal.” In other words, the link between the concept and the “injustice” is the general mark of the doctrine which differentiates it from the scientific researches contained in the science of economics. In spite of all of this, however, there is often a difference between the scientific research that deals with production and that which deals with distribution. Let us take the law of the crop underproduction and the iron law of wages as examples: The first law represents the scientific research in production; the second represents the scientific research in distribution. If we study the crops underproduction law, we will find it to include one fact about agricultural production applicable to land in every human society, regardless of its economic doctrine. Land in the capitalist society, according to that law, decreases in producing crops in the same manner it does in the Socialist or Islamic society. This means that the crops underproduction law is not confined to the situation of one particular doctrine; rather, it expresses an absolute scientific fact. As regarding the iron law of wages, which we explained in the second example, it discovers, as we have already seen, the fixed level of laborers’ wages in a society that enjoys economic freedom. It concludes by stating that in a society wherein freedom dominates, laborers’ wages always remain on the level of subsistence. If they rise or fall, for any reason whatsoever, they always go naturally back to that same level. This law is scientific in nature, context and objectivity because it tries to discover the reality and to get acquainted with the movement and direction of wages as it takes place in the society. At the same time, it decides that such a fact is true only in the capitalist society in which economic freedom prevails, and it is not applicable to the society which is economy-geared (to a certain direction), one wherein the government enforces restrictions on wages. SCOND: The science of economics deals with both production and distribution, while the economic doctrine deals with both production and distribution, and there is no basis for distinguishing between them (between the science and the doctrine) on the basis of the subject-matter by making production the concern of science while assigning distribution as the concern of the doctrine, because science and doctrine differ only in the task and method of research, not in the subject-matter. This difference in the basic function necessarily requires their difference in the methods of research. This means that the science of economics, as such, discovers what occurs in the world and in the society of everything related to the economic life, using the scientific methods of observation and experiment, monitoring the events the economic life is full of in order to derive, in their light, their interrelations and general laws. Whenever there is a case to doubt, and the extent of its truth and reflections of reality are not known, the economist is capable of referring to the scientific criteria and to his own well-organized observations of successive events in order to discover the extent of the truth of such case and of its being a true reflection of the reality. Both economist and naturalist are on the same footing in this aspect: When the naturalist desires to find out the degree at which water boils, he can scientifically measure the water’s temperature as a natural phenomenon, observing the temperature when boiling starts. When the economist desires to discover the sequence of famous crises which inflict the human society from time to time, he has to refer to the events of the economic life as they happened successively in order to determine the historical dividing line between one crisis and another. If he finds such a line to be the same in all crises, he will be able to define the cycle of such crises and in the end look for their causes as well as the factors that affect them. Contrariwise, the economic doctrine cannot measure the subjects it deals with scientifically because it studies such subjects from the angle of equity and justice, trying to find a regulation method according to the demands of justice and equity. Obviously, justice is different from the water temperature and boiling degree, and it is different from the economic crises and cycles, because the latter are not cosmic or social phenomena which can be observed subjectively or measured scientifically through the well-known means of experiment in the world. In the economic doctrine, it is not sufficient to look at facts and observe events scientifically in order to know what equity is in organization, as is the case with the economist who studies economic crises in order to know their cycle and code. There are some people who say that equity in distribution is achieved in the shade of a system that guarantees equality among all members of the society during austerity as well as during prosperity, and there are others who consider equality of freedom among the members of the society, instead of equality in sustaining them, to be the just basis for distribution, even if individuals practice their free right to variations in sustenance and the increase of the wealth of some over that of others, as long as they all enjoy the same freedom granted equally to each and every one of them. There are also others who see that the equity of distribution is achieved through guaranteeing a general level of sustenance to all people, while granting them freedom outside the limits of such level, as does Islam. Islamic economics, as we have come to know at the onset of this research, comprise an economic doctrine, not a science of economics. When we say, “Islam produced an economic doctrine,” we do not claim that Islam invented the science of economics. Islam did not come in order to discover the events of the economic life, its interrelations and causes; this is not its responsibility. Nor is it responsible for uncovering for people natural laws, the cosmic phenomena, their interrelations and causations, etc. Just as religion does not necessarily have to contain astronomy and natural sciences, by the same token, it does not have to contain the science of economics. In other words, if Islam had come in order to narrate to us about the economic life in Hijaz (where Islam had set roots), and the reasons which cause the Hijazi society, for e.g., to increase the interest rate the lenders receive, then such a narrative would be scientific, one which deals with the science of economics. But, instead of this, Islam has come to evaluate and consequently prohibit such an interest, regulating the relationship between capital and the project’s owner upon the basis of contracting instead of usury and interest; hence, Islam adopts the doctrinal position, not the scientific one. I do not know what those who disbelieve in the existence of the Islamic economic system, or of the solutions to the economic problems in the Muslim society, say about the period of such an application during the dawn of Islam. Did not Muslims at the dawn of Islam live as a society that led an economic life and applied Islam in all its social activities? Was not the leadership of the Islamic society in the hands of the Prophet (ص) and according to the tenets of Islam? Did not that leadership possess defined solutions in dealing with its problems of production and distribution and various other economic problems? What if we claim that these solutions express Islam's way in regulating the economic life and, then, an economic doctrine in Islam? Someone may say, "The economics you claim to exist in Islam do not comprise an economic doctrine but an ethical code the religion (of Islam) provides as guidelines which Islam exhorts people to follow. Just as Islam enjoined the prohibition of deception and backbiting, etc., it also enjoined helping the poor. It prohibits injustice, admonishes the rich to console the needy, forbids the strong from confiscating the rights of the weak, and warns the first against earning their wealth through illegal means. It also imposes a mandatory rite, among others, called zakat. It imposes it besides prayers, pilgrimage and the fast in order to make a variety in the means of worship, and to emphasize the necessity of helping the poor and being generous to them. The facts about Islam and its economics do not agree at all with such an interpretation which reduces the level of Islamic economics to that of mere providing counsels and ethical codes. It is true that the ethical trend is obvious in all Islamic tenets. And it is true that Islam contains a huge multitude of injunctions covering all spheres of life, the human conduct, and the economic sphere in particular. It is also true to say that Islam has gathered the most fascinating means to ethically nurture the Muslim individual, help the growth of his good energies and bring out of him perfection personified. But this does not at all mean that Islam confines its teachings to ethically nurture the individual while setting social organization aside. Nor does it mean that Islam preaches only to the individual rather than being, in addition to this, a doctrine and an organization for the society in its various aspects of life, including its economic life. Islam has not forbidden injustice, admonished people to be just, warned them against transgressing against the rights of others, without defining the concepts of injustice and iniquity, from its own viewpoint, or without outlining the rights not to be trespassed. Islam has not left the concept of justice, injustice and righteousness clouded with obscurity, nor has it left their interpretation for others, as do ethical preachers. Rather, it has brought a defined image of justice and general rules of coexistence of people in the fields of wealth production, distribution and handling, considering any deviation from such rules and the justice it defines as sheer injustice and flagrant transgression on the rights of others. Had Islam come simply in order to say to people, "Quit injustice! Practice equity! Do not be transgressors! "—leaving to them to define the meaning of "injustice," to draw the portrait which embodies justice and to agree on the rights required by equity according to their own circumstances, education and the ideals in which they believe and the interests and needs they realize. Had Islam left all of this for people to determine, confining itself to enjoining justice and attracting people towards it, forbidding injustice and warning them against it through both methods of attracting and warning…, then it would have, indeed, remained a preacher and nothing else. As regarding Islam urging the rich to help their poor brethren and neighbors, it is true, but Islam did not confine itself to merely urging and ethically admonishing the rich; rather, it has imposed on the State the obligation to guarantee the securing of the rights of the needy, and to provide them with an honorable living standard in a way that falls into the backbone of the Islamic system which regulates the relationship between the ruler and the ruled. According to the hadith narrated through the authority of Imam Mousa ibn Ja'far al-Kazim, peace be with him, the Imam mentioned, while defining the ruler's responsibility in faring with zakat, that he has to take this money in order to divide it in the way which God has ordained to eight shares to the poor and the needy, to distribute it among them till they become self-sufficient for an entire year without fearing any hardship or stringency. If any amount of it is left, it will have to be returned to his treasury, and if it is not sufficient for the public, the ruler will then have to provide them from the treasury according to their needs and until they become self-sufficient. Zakat is one of the most significant of all rites. Its use as a tool to implement social security in the Islamic society, as we have seen in the previous text, is alone sufficient to distinguish it from all other rites of an "individualistic" nature. This proves that it is not merely an individual form of worship, an ethical exercise for the rich to be kind to the poor; rather, it is on the level of social organization of people's way of life. Add to this the fact that the very legislative structure of zakat expresses a general doctrinal aspect in Islam. The texts which deal with zakat indicate that the latter is given to the needy in order to improve their general standard of living. This proves that zakat is part of a general Islamic plan aimed at finding harmony and a generally unified standard of living for members of the Muslim society. It is obvious that planning for such harmony is not preaching but is an organizational ideology on the level of an economic doctrine. The first example is related to ownership which is the focal point of difference among all economic doctrines. Capitalism considers private ownership as the rule, and general ownership as the exception. This means that every sort of wealth, and every natural resource, allows private ownership unless there is a specific need that necessitates its nationalization which brings it out of private ownership. Marxism considers common ownership as the basis and the rule, and no private ownership is allowed for any sort of natural resource or means of production unless there is a particular necessity which enforces the opposite; it is only then that private ownership becomes permissible, within the limits of the necessity, and as long as such necessity exists. Islam, on the other hand, is different from both doctrines in its treatment of this subject. It calls for the principle of "combined ownership," that is, diversified ownership, considering both common and private ownerships to be on one and the same footing, each having its own scope. Does not this Islamic attitude express an Islamic viewpoint on the doctrinal level of the capitalist and socialist positions? When the principle of private ownership makes a cornerstone of the capitalist doctrine, and the principle of common ownership a cornerstone in the socialist Marxist doctrine, why can't the principle of combined ownership (the one that has both public and private sectors) be the cornerstone in the Islamic economic system? Another example is related to the income earned from the ownership of the sources of production. Capitalism permits such earning in all its ways. Whoever owns a source of production has the right to rent it and earn an income from its rent without doing any labor at all. Marxist socialism prohibits all sorts of income earned from the ownership of the sources of production because such earning, according to its philosophy, does not require any labor. The wages which, say, the owner of a mill receives from those who use his mill, and the wages the capitalist receives in the name of interest from those who borrow his money, are not allowed in Marxist socialism, while they are permitted in capitalism. Islam treats the same subject-mater from a third viewpoint. It distinguishes between the earning methods based on the ownership of the sources of production and other methods as well. It prohibits interest while allowing the mill's wages. Capitalism permits both interest and the mill's wages in agreement with the principle of economic freedom or free enterprise. Marxist socialism does not permit the capitalist to earn interest on loans, or the mill's owner to receive the wages, because labor is the only justification for legal earning: When the capitalist lends his money, and when the mill's owner lends his mill, neither of them does any labor at all. Such as the case of one who invests one hundred dinars on his land just to get, say, a yield of twenty bushels of grain. If he doubles his investment and spends two hundred dinars, instead of one hundred, he will not gain twice the yield but less than that. If he spends three hundred dinars, he will not gain three times the yield but a smaller percentage than the one he gets if he spends two hundred dinars. Thus, the percentage of the increase in the yield that results from doubling the amount spent will continue to decrease till it disappears, resulting in a total loss of expense. The reason for this is the fact that the land, which is the primary factor determining the production, is still the same. Doubling the amount spent is not sufficient [by itself] to double the production as long as the principal factor determining production, that is, the land, remains to be the same.